An electric toothbrush uses power that is supplied by a internal rechargeable battery. This powers an internal motor and brush head which will either feature side to side oscillation or rotation oscillation. Rotation oscillation is when a brush head rotates in one direction and then changes to rotate in another. Clinical studies have shown that electric toothbrushes are superior to regular manual brushing. This has been known for decades. Initially, electric toothbrushes were created for dental patients that had limited motor function and needed assistance in brushing their teeth. Also, they were given to patients that had braces. The first electric toothbrush that caught the public’s attention in the United States was the General Electric Automatic Model Toothbrush. Introduced in the 1960s, this model differed from its competition because it used a rechargeable NiCad battery. Other electric toothbrushes plugged into the wall outlet. There were a lot of issues with the NiCad batteries, though. The toothbrush ended up being about the size of a flashlight handle that held two D cell batteries. In other words, they were very bulky. Additionally, the rechargeable batteries suffered from lazy battery effects and memory retention. If the toothbrush was kept on the charger fairly often, this resulted in the batteries lifespan shortening to just a few minutes. It was not uncommon that the General Electric model electric toothbrush ran out of power before its users were done brushing their teeth. Many families would share the handle which held the batteries, because you could connect separate brushes. The main issue was that the batteries were sealed into the device and would have to be discarded if the batteries failed. By the 1990s, there were a lot of problems with the safety certifications of Broxodent’s electric toothbrush models. Broxodent was a close competitor to General Electric in electric toothbrushes. Their model was much more compact and it even fit into today’s standards. There were a lot of issues with safety protocols for AC outlets in bathrooms in countries outside of the US. Wiring standards required certain protection for the outlets in bath areas. As batteries improved, in came the competition. Philips Sonicare and Braun Oral-B were two large competitors in the United States. The public visibility of these large brands forced Broxo to take their sales online. Soon after, Broxo stopped selling their electric toothbrushes in the USA. Research shows that electric toothbrushes are better than manual toothbrushes. This is mainly due to the fact that it becomes much easier for the user to brush effectively. The benefits of an electric toothbrush rely mainly on the condition of the brush head. Brush heads lose their effectiveness over time because the bristles break down and wear out. It is much easier to spend more time brushing your teeth when you are using an electric toothbrush. Independent researchers found that users of electric toothbrushes will put more effort into brushing their teeth. 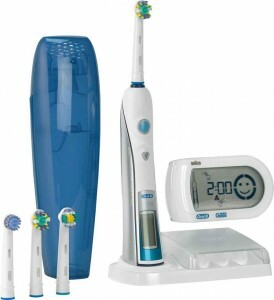 Some electric toothbrushes come with a timer and a display. This ensures that you are brushing your teeth for the proper amount of time and will encourage you to make the right choices. You might be brushing your teeth two or three times a day, maybe even using electric toothbrushes and the best teeth-whitening toothpaste but never see any visible results in the color of your teeth and might be wondering what you’re doing wrong. Well, nothing really. Keep that up but you must also know that to obtain that shiny white effect on your teeth you will need much more than applying that daily brushing routine, you’ll need a specific teeth whitening treatment. Keep that up but you must also know that to obtain that shiny white effect on your teeth you will need much more than applying that daily brushing routine, you’ll need a specific teeth whitening treatment. Which is Most Effective when brushing your teeth, an Electric Toothbrush or a normal Manual toothbrush?